The Historic Preservation Board this week voted 5-2 to begin the process of designating the International Inn, located at Miami Beach’s gateway to North Beach, as an historic site. What makes the action unusual is that the process is being initiated by the City over the objection of the property’s owner. 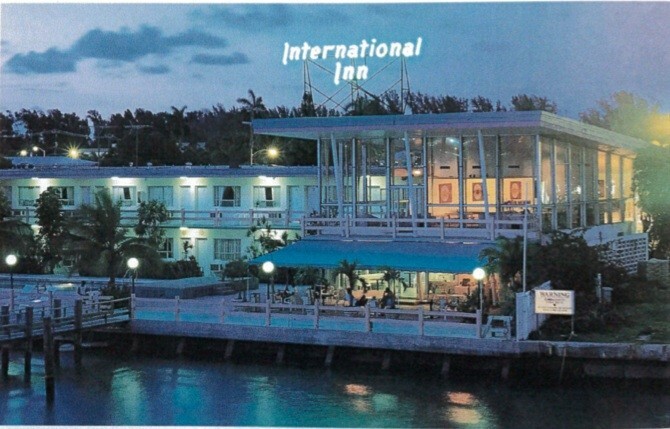 The International Inn at 2301 Normandy Drive was built in 1956. It was designed by Melvin Grossman, a protégé of Morris Lapidus, in the post war modern style. Grossman also designed the Seville Hotel (2901 Collins) in 1955, the Deauville at 6801 Collins in 1957, and the Doral Beach Hotel (4833 Collins) in 1962. A preliminary Staff report indicates the Inn satisfies the necessary criteria and is likely eligible to be designated historic. Tachmes told the Board in more than 20 years of historic designations, “The City has never – not once – designated involuntarily an individual site as historic.” Entire districts have been created that involuntarily designated properties, he said, but those involved groups of properties that were all treated the same. Tachmes objected to the process saying, to his knowledge, no one had sought to discuss the designation with his client. “She got a notice in the mail,” he said. Tachmes suggested a deferral of the action in order to have a dialogue between his client, the City, and preservationists with regard to the historic preservation process. He said Tsay wants to be cooperative but that there are legal options that can be taken. While he said no one wants to go down that path, he urged a dialogue before the situation is no longer amicable. Following public discussion of the issue on social media, Board member Nancy Liebman asked the HPB to discuss the designation process in May. At that time the Board asked Staff for the preliminary report on eligibility which is what was considered this week. “The historic preservation criteria are very objective,” Ciraldo continued. “They’re based on very specific parameters .. Only one of the criteria has to be met in order for it to be worthy.” In this case, he said, four of the criteria have been met for designation. “Yes, many things need to be done better and I hope that, if anything, this results in a dialogue with the property owner to recognize the eyesore that this building is on the entrance of our community,” he continued. “But you designating it isn’t going to take away all of those problems.” Veitia said he supports local designation of historic areas but forcing one property owner to designate gives him pause. Board member Wyn Bradley told Tsay, “You have a beautiful, beautiful building. You have a crown jewel that needs care and that needs love. And I know you love your building. There are a lot of people that want to show you how much love the community has for it and how many resources are out there to help you with your building, so I hope you can understand that and know just what a valuable asset you have in your possession to care for.” She said she supported moving forward with the designation process. “I would like to see us be more articulate so that we can strengthen our role as a board in the community,” he said. “I think we fail to do that when we seem capricious and in some sense this seems a little capricious.” Without the property owner having a full understanding of the advantages and disadvantages, he said he thought it was unfair for the Board to take action this week. Board member Scott Needelman said, “One of my main concerns is with the involuntary designation.” When he asked if other such processes had been started and abandoned, staff member Debbie Tackett said recent attempts included a single family home at 42 Star Island in which MDPL submitted an application that was ultimately denied by the Commission and an application filed by the City to designate the Rod and Reel Club on Hibiscus Island which was also denied by the Commission. Stuart suggested deferring a vote for a month in order to show “good faith” with the owner and the community to allow the dialogue about the preservation process to take place first before voting to take the next step. But the Board voted 5-2 to move forward with designation with Stuart and Pardo voting no. Both indicated they favored deferral. The presentation of Staff’s preliminary evaluation is only the first step in the historic designation process. The Board’s vote this week to accept the evaluation and begin the process of a formal designation report can be modified or denied by the City Commission within 60 days. If the Commission does not modify or deny the action, the process will continue. It would then require a formal recommendation to the Commission, followed by Planning Board review and back to the Commission for two readings and public hearings. The next step, a Letter to Commission, relaying the Board’s decision was sent to the City Commission yesterday along with Staff’s preliminary report. The Commission has two meetings within the 60 day window (October 18 and October 31) at which they could modify or deny the request. Otherwise, the process will continue.